This family of five's garage takes a beating, but Monica and Jess are able to tame the mess and give them a space for living. Watch as they create a perfect mudroom and organized garage with space for everything, including the car, all for under $800! Many homeowners can relate to Ann and Peter's over-packed garage. Between the kids bikes, balls, and scooters, and Peter's tools, the garage is storing everything except for the car. Design bloggers Monica and Jess are called in to make this multi-purpose garage actually functional. The garage also acts as an entryway for the kids, as well as a pantry overstock storage room. Ann and Peter only have $800 to spend and tons of chaos that needs taming. After clearing the loads of stuff out of the garage, Monica and Jess are able to get a good look at the space. In order to tame the space, they want to create different areas of the room for different purposes. Storage space is going to be key in creating an organized, stylish mudroom and garage. Ann and Peter have a very traditional taste, but of course Monica and Jess are ready to push the boundaries with a bright yellow paint color for the walls with aqua and grey accents. These colors brighten up the space and make it feel more like an entrance to their home, not just a boring old garage. One feature in Ann and Peter's inspiration photos were mudroom lockers, which are great for keeping organized, but can cost up to $5,000. Luckily, Monica revamped her own garage with mudroom lockers just a few years ago and knows exactly how to recreate the locker effect for half the price. Using plywood, Monica and Ann build a cube unit that will be a storage area for shoes and the base of the locker units. Next, they build a larger rectangle on top with dividers for each person to have a place to hang their coat and bags. Above the lockers, they hang two sets of cabinets - one that Ann already had and an identical set they purchased for cheap - to store Ann's large pantry items. An active young family means a lot of bikes! Although the homeowners had a great, functional bike rack, it took up too much floor space, so Jess and Peter are going to build replacements that hang on the wall instead. They screw together one long vertical piece of wood with several smaller pieces going across at different heights. On each horizontal piece, they place two large bike hooks. When mounted to the wall, this bike rack will serve as a great storage solution, but also look like a work of art in this stylish garage. Before, Ann's pantry items were just tossed onto high deep, shelves, and since Ann is a little vertically challenged, she couldn't even see the items to know what she had. 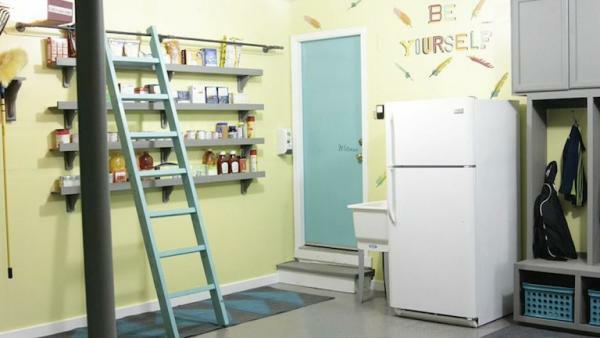 Jess has the perfect DIY solution: making long, narrow shelves to store her pantry items and building a hanging ladder on a track so she can access them all. Using 2X4 pieces of wood, Jess and Anne build the shelves and use the rest of the 2X4 pieces of wood to create a ladder. They use a level to make sure that each step is placed correctly and then drill a notch out of the top of the ladder so it can rest against the track. A garage cement floor isn't particularly stylish, so Monica and Peter paint the floor gray using Epoxy paint. Painting in small sections, they add color flakes to the paint as they go, which will give the floor a speckled, high-end look. The Epoxy paint will hold up for some serious four season wear and tear while the dark grey color they chose will hide the dirt. Since the garage door acts as a main entrance to the house, rugs are essential for wiping off dirty shoes. Jess and Ann cut a large $20 rug in half to make two rugs. They then use tape and spray paint to create an arrow pattern for one and make their own letter stencil that spells out "shoes" for the other, which will go in front of the lockers they built. This fun, simple project adds a young element to appeal to the kids as well as remind the kids to take of their dirty sneakers. While Jess and Ann are getting spontaneous with spray paint, Monica and Peter are tackling the tool station. Peter has a ton of work tools, but they were just shoved in the corner or thrown into a small cabinet. Using plywood, Monica and Peter build a shelving unit around the pre-existing cabinet and install deep shelves. They then trim the structure and paint the shelves the same accent gray as the lockers. Now Peter can really get his hands dirty and get his own DIY projects done. Everyone has those bulky, awkwardly-shaped garden tools and cleaning supplies, like brooms and mops. Monica knows the perfect small-scale project that will make a huge impact when it comes to storing them. She builds a storage rack for under $20 by mounting two wooden brackets on the wall and adding on a shelf with notches in it so everything can hang on the shelf. Her secret tool for cutting the notches? A bottle cap used as a guide creates the perfect space for storing all Ann's brooms, mops, tools and more. Monica and Jess kick Peter and Ann out of their garage so they can add all the finishing touches before the final reveal. The homeowners are nervous, but excited to see their garage transformed from a cluttered mess to an organized, efficient space. Ann and Peter are so excited by the change - so practical, functional and stylish! Ann says she feels so calmed and soothed by the lack of clutter, and they're both excited about how there's a space for everything, including the car! Not only is this the garage of their dreams, Monica and Jess were able to knock the price of this garage and mudroom makeover to $777! A budget-friendly, family-friendly transformation that will completely change how this family uses the space and help them stay organized! With bikes, sports equipment, tools, toys, shoes, bags and more, no wonder this family's garage is a cluttered mess. But Monica and Jess are ready to make a plan to transform this garage into an organized, functional space on a small budget. Storing bikes has always been such a pain and so unsightly. Here's a way to easily make a bike rack that gets those bikes up off the floor and onto the walls in a way that looks tidy and stream-lined, and on the cheap, too! The one feature of a garage that makes it feel like a cold outdoor space is the concrete floor! To make it feel like an extension of your home, try painting it with this DIY technique that will make it look like an expensive stone floor. Keeping all your mops, brooms, cleaning and garden tools organized can be tough, and store-bought tool racks can cost a pretty penny. Here's how to build one yourself on the cheap with a simple tool - a bottle cap! See how Monica and Jess transformed a chaotic garage into a sleek mudroom and organized space for a family of five. Get step-by-step directions and see detailed photos on the projects for the family garage and mudroom transformation.